A computer generated astrology report can help you understand your birth chart so you can begin seeing how to make the most of your unique astrology. 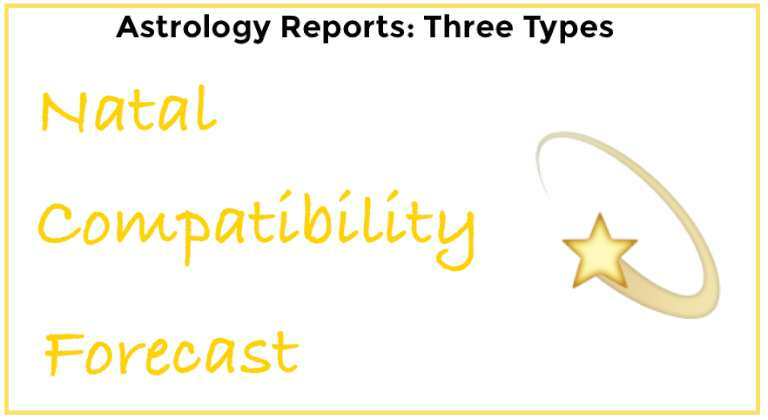 The three major types of astrology reports are: natal, compatibility, and forecast. See below for details on each type. There are three major kinds of birth chart astrology reports. We offer options in all these category. Natal reports interpret your astrological birth chart, telling you where all the planets were when you were born and giving you descriptions of what each planet in a particular sign (and particular house, if you supply an exact birth time) means. Compatibility reports look at two people’s charts to offer guidance on what the people have in common and what differences they experience. They also provide some ideas on how to harmonize the various planetary energies to help foster a constructive relationship. Forecast reports look at upcoming planetary placements that will affect you and provide guidance on how to prepare for them and handle their energies constructively. You can see samples of these reports now. Visit our online astrology report and chart service and click any of the pink “View Sample” buttons to see a sample report. An astrology report lets you enjoy your life by helping you know your personal astrology better. It’s one of the best ways to understand who you are and why you’re here in this lifetime. And THAT gives you the precious gift of knowing how to be your very best self, living up to all that your soul yearns to express. Let these reports help you dig deeper into your personal astrology. As you refer to them over the months and years ahead, you’ll find yourself living in harmony—easily, naturally, and beautifully. I’ve looked at your new site countless times to happily pay for a chart. Each time I give up, too confusing. I thought you should know. Thanks for what you do, though! Hi, Laurel. Thanks for your feedback – appreciate hearing about your experience. Happy to help you with chart reports: please get in touch using our contact form https://astrologeranne.com/legal/contact/ and include the best phone number and time to reach you. Will look forward to hearing from you, and thanks again for getting in touch.